Your dog will board with us in perfect harmony and relaxation. Our veterinary hospital provides luxurious accommodations that will turn our animal hospital into your dogs’ home away from home. Imagine opening your veterinarian’s office and having your dog be so excited to be boarding the weekend that they pull you to the correct door and wait happily for one of the WPVH team to greet them, take them for a quick walk and get them comfortable in their large, climate controlled room, complete with a nice soft bed or blanket. This happens every day at WPVH. You get a vacation - your dog gets a vacation, safe and secure at our veterinary hospital. Our dog boarding areas are 15 – 40 sq. ft. and provide ample room to stretch and relax comfortably. We always provide nice blankets and beds to enhance your dog’s comfort while staying at our veterinary hospital. Outdoors we have 3 large walking and play yards where your dog will get three walks a day with time to run and play. 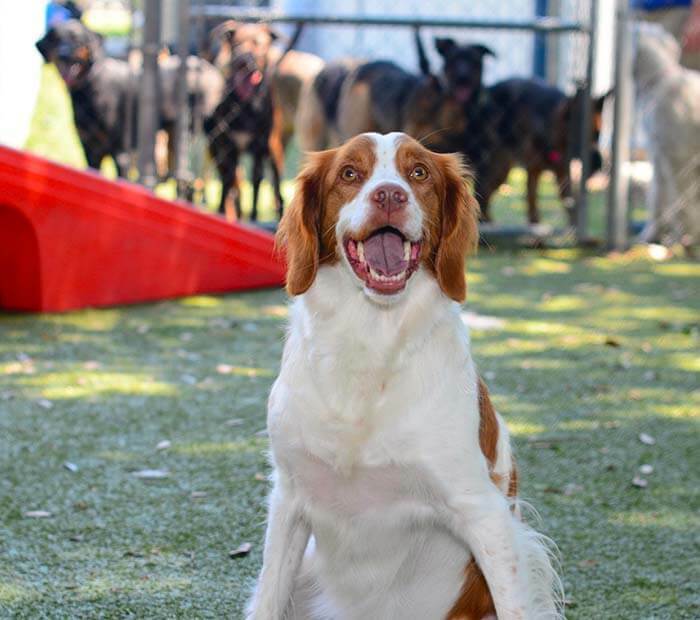 If you want your dog to have an extra special experience during their stay sign up for doggie playtime. They receive 3 supervised play sessions a day where they get to play and socialize with other dogs also boarding in our veterinary hospital. We provide toys and other play items to provide a great way to burn energy and have fun. If your dog would rather enjoy the fresh air alone, you can sign him up to two extra walks per day for total of five walks. This provides your dog with extra one on one time with our passionate staff. As an animal hospital your dog’s safety and well-being is always our top priority. We have strict boarding requirements to ensure a healthy environment for all our boarding guests. In addition, for your peace of mind your dog stays in our veterinary hospital so our highly skilled veterinary teams are always a few feet away.